EXTRA: The earrings are stud type. Each holds a brilliant cut diamond on the center. They are surrounded by smaller brilliant cut diamonds. This is a pretty pair. DIAMONDS: Each earring holds 13 brilliant cut diamonds. Conflict Free Diamonds. Sparkling Diamonds – Diamond & Jewelry manufactures and exports fine diamond jewelry. With thirty years of experience within the industry, Sparkling diamonds is able to provide premium quality with excellent service, warranty's on all goods and competitive prices. 100% NATURAL CLARITY NOT ENHANCED OR TREATED IN ANYWAY! Joyaassilver Jewelry is Handmade Designer Jewelry. In case you need any clarification or information about any of our products, pls. We shall get back to you within 24-48 hrs. Joyaassilver Team. 6-3.5mm round diamonds. Diamond Information. 1.16cttw total weight. SI3-I1 clarity H color. Photos have been enlarged to show detail. Resizing and Fees. 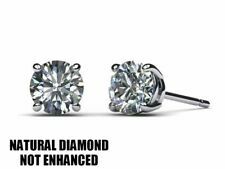 Real Natural Diamond Stud Earrings 1.00 Carat D VS1 Round Cut 14k White Gold. Clarity / Color:VS1 / D. We are a subsidiary of a well respected diamond manufacturer and exporter of clarity & color enhanced diamonds. Photographs have been cropped and enlarged to show Diamonds close up. Certified. 50% OFF. Watch Video. The Ultimate Gift! Here is a Fine Princess Cut Diamond White Gold Stud Earrings. Made from Solid 14Kt White Gold and weighs 1.9 grams. It holds 2 Natural Princess Cut Diamonds that add to 1.20Ct F Color VS1 Clarity, Full of Shine and Fire. STUD EARRINGS WERE ALWAYS LATEST FASHION AND WILL BE, BUT THEY ARE SO HOT NOW AND EVERY CELEBRITY OWNS ONE, BUT THESE ARE FAR MORE BEAUTIFUL. THESE EARRINGS ARE OF A KIND AND ONLY, THE BEAUTY AND THE VALUE OF THEM LASTS FOR EVER, FOR YOURSELF OR A MAGNIFICENT GIFT FOR A LOVED ONE. THEY HAVE 2 LARGE CENTER DIAMONDS THAT ARE SO HARD TO FIND. ALL AROUND THE LARGE DIAMONDS THERE ARE A ROW OF FULL CUT DIAMONDS THAT ADDS MORE BEAUTY TO THESE GORGEOUS STUDS. STUD EARRINGS WERE ALWAYS LATEST FASHION AND WILL BE, BUT THEY ARE SO HOT NOW AND EVERY CELEBRITY OWNS ONE, BUT THESE ARE FAR MORE BEAU TIFUL. Color Stones Change (White Topaz, Blue Sapphire, Ruby etc). Single Diamond Carat Weight - 0.50 Ct. Diamond Type- Lab Created Diamond. Total Carat Weight - 1.00 Ct. We have also introduced Diamond jewellery in 92.5 Sterling Silver. THE ORNATE ANTIQUE DESIGN OF THESE EARRINGS IS A SHOW STOPPER. THE DELICATE WORK ON THEM MAKES THEM EVEN MORE UNIQUE AND GLAMOROUS. THEY HAVE 2 LARGE CENTER DIAMONDS THAT ARE SO HARD TO FIND AND THE STONES ARE REAL WHITE AND SO SHINY AND EYE CLEAN. 1.00 CT. BAGUETTE DIAMOND & MOON STONE STUD EARRINGS 14K YELLOW GOLD. Pave Diamond Bangle. Pave Diamond Jewelry. Pave Diamond Bead Ball. Polki Diamond Bangle. Diamond Wedding Bangle. 925 Sterling Silver Jewelry. Rose Cut Diamond Bead. Wide Cuff Bangle. Pave Diamond Bangle. Pave Diamond Jewelry. Indian Ethnic Necklace. Pave Diamond Bead Ball. Polki Diamond Bangle. Diamond Wedding Bangle. Rose Cut Diamond Bead. Wide Cuff Bangle. 1 CT Black Diamond Stud Earrings 14k Yellow Gold. The Black Diamonds are Heat Treated. The Total Carat Weight of the earrings are 1.00 CT. The minimum total diamond carat weight is 0.96 CT.
6 prong lace diamonds earrings. 1 round diamond 4.98mm. 1 round diamond 5.09mm. Diamond is chipped. DIAMOND IS CHIPPED. Diamond Information. Resizing and Fees. 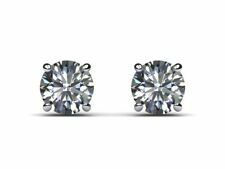 New 14K White Gold 3D Double Square 1.00 CTW Round Diamond Stud Earrings. We are proud of the joy and happiness we have provided thus far and hope to provide even more. Approximate Weight - 5.4 grams. Joyaassilver Jewelry is Handmade Designer Jewelry. In case you need any clarification or information about any of our products, pls. We shall get back to you within 24-48 hrs. This pair of large round brilliant cut natural diamonds are prong set in a 14k gold settings. Both earrings include push backs for comfortable wear. 1.00ct total diamond weight. Pave Diamond Bangle. Pave Diamond Jewelry. Pave Diamond Bead Ball. Polki Diamond Bangle. Diamond Wedding Bangle. Rose Cut Diamond Bead. Wide Cuff Bangle. Diamond Feather Jewelry. 1 princess diamond . 50ct. ONLY ONE DIAMOND IS CERTIFIED BY THE GIA. Certified Diamond Information. Non-certified diamond information. Diamond Information. Photos have been enlarged to show detail. Resizing and Fees. Plating: Rhodium. Finish: High polish. Type: Diamond. Stone shape: Round. Cut, Color, Clarity, and Carat Weight. Cut: Very good. Color: I-J. GIA round diamond earrings. ONLY ONE DIAMOND IS CERTIFIED BY THE GIA. 1 round diamond . 55ct. Certified Diamond Information. Non-certified diamond information. Diamond Information. Gram Weight. Photos have been enlarged to show detail. Princess diamond double prong U earrings. 1 princess diamond . 61ct. ONLY ONE DIAMOND IS CERTIFIED BY THE GIA. Certified Diamond Information. Non-certified diamond information. Diamond Information. Photos have been enlarged to show detail. GIA 6193909374. GIA 2195909344. Certified Diamond Information. brilliant round. Diamond Information. PHOTOS HAVE BEEN ENLARGED TO SHOW DETAIL. Resizing and Fees. Joyaassilver Jewelry is Handmade Designer Jewelry. Joyaassilver Team.